Crunchy, healthy, and completely addictive. 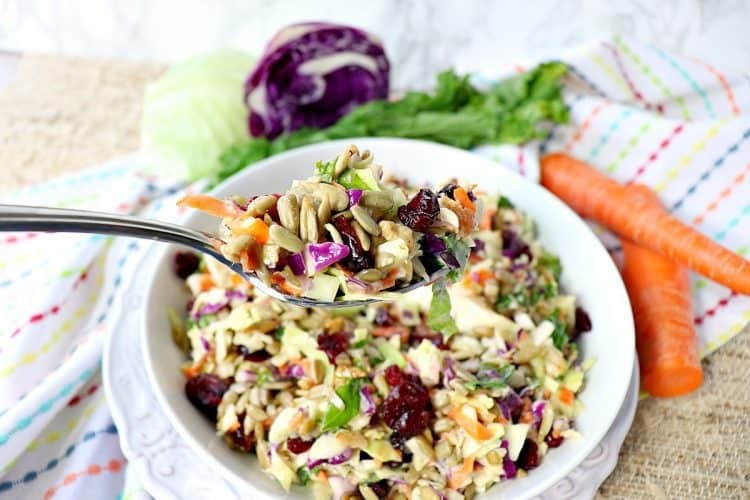 This Copycat Sunflower Crunch Kale Cabbage Salad has it ALL going on!! Healthy and delicious! 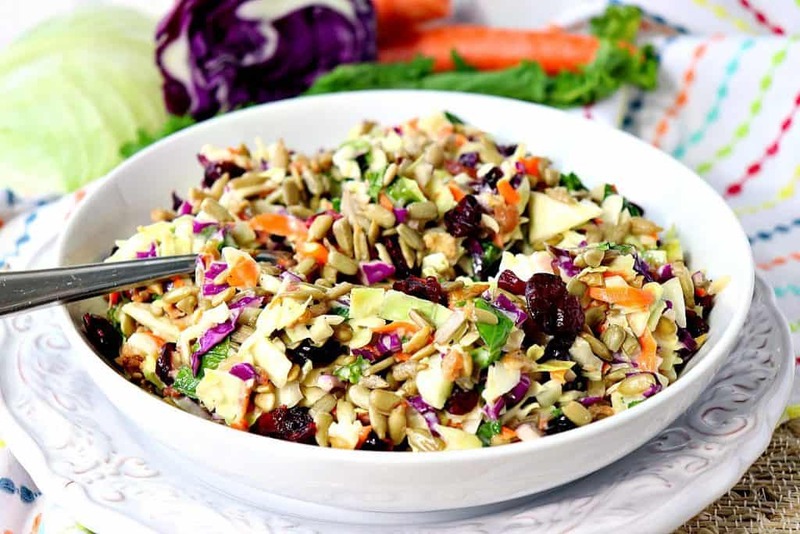 Dig in, you’re going to love this colorful salad! Mix up a big bowl of this Sunflower Crunch Kale Cabbage Salad, and you’ll have lunch ready for the entire week. Add cooked chicken, and it can also do double duty as dinner. Whenever you serve this salad; lunch, dinner, or even a party, be ready for people to fill their plates and then come back for more. It’s a winning combination of flavors and textures that will soon become your signature dish! 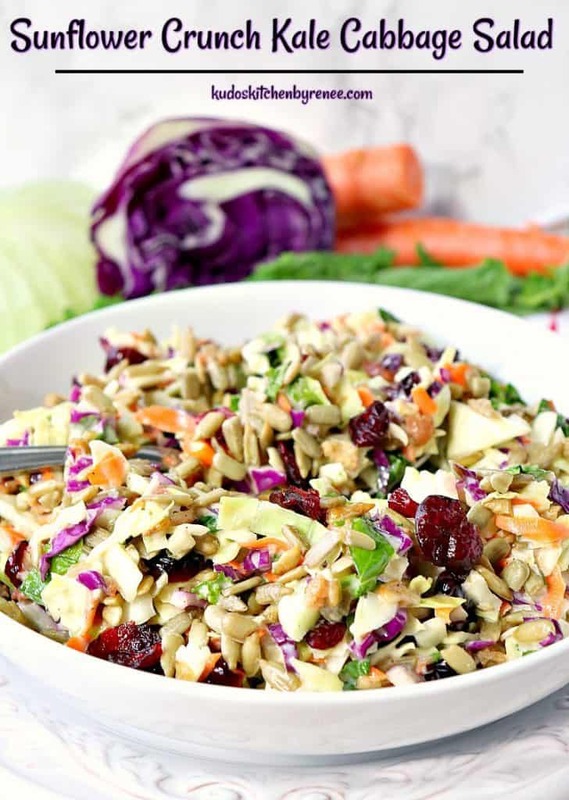 **Please Note – The printable recipe card with detailed instructions and complete ingredient measurements for making Copycat Sunflower Crunch Kale Cabbage Salad is available near the end of this post. The reason I call this a copycat salad is that it mimics my favorite bagged salad which I purchase in the produce section of the market. What if I wanted a vegetarian salad? Can I leave the bacon out? By all means…YES!!! It’s your salad, your call! Do I need a food processor to chop the cabbages and carrots? No, not at all! I didn’t use one. I used a chef’s knife and cutting board. Slice the cabbages thinly (removing the core), and then crosscut the thin slices into tiny pieces. Easy, peasy with no extra equipment to wash! How long will this salad keep in the refrigerator? Keep it well covered and it will last in the refrigerator for up to 5 days. Can I substitute other nuts for the sunflower seeds? Try making this with chopped pecans, hazelnuts, cashews, or even chopped macadamia nuts. Since I’m a nut and seed girl, I’m certain that any (or all) of them would be a tasty addition. This salad tastes best after it’s had a chance to sit in the refrigerator at least 60 minutes before serving so the flavors can blend and marry, so please plan accordingly. Please like and subscribe to my Kudos Kitchen channel on YouTube. 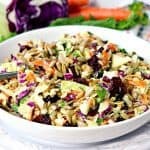 **The following affiliate links are some suggested products I’ve chosen that will aid you in the making and serving of this recipe for Copycat Sunflower Crunch Kale Cabbage Salad if desired. 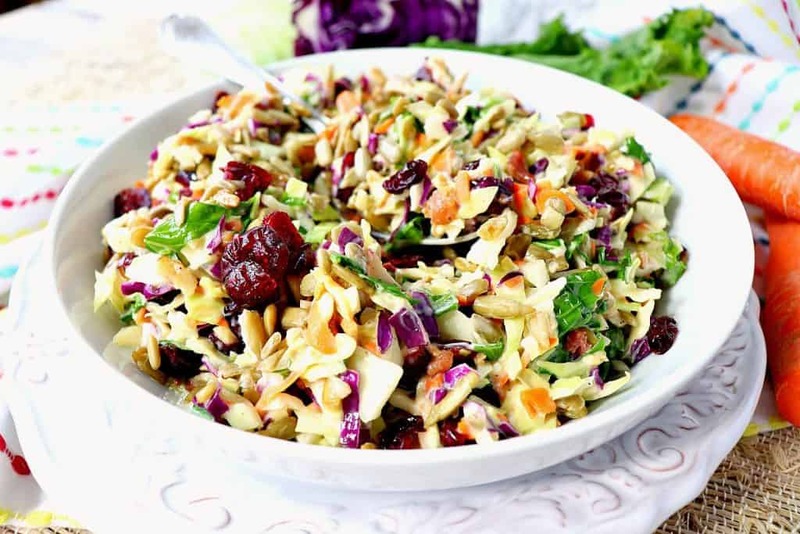 Below is the printable recipe card for today’s Copycat Sunflower Crunch Kale Cabbage Salad. What is the serving size of this salad? Crunchy, healthy, and completely addictive. 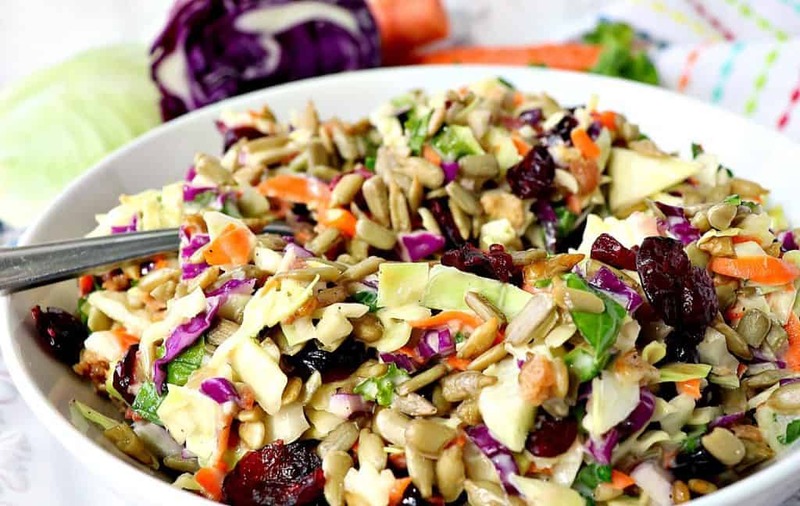 This Sunflower Crunch Kale Cabbage Salad has it ALL going on!! In a large bowl, stir together the green and purple cabbage along with the prepared carrots and kale. Add the salt, pepper, bacon bits, garlic, sunflower seeds, and dried cranberries. Stir well to combine. Set aside. In a small bowl, whisk together the mayonnaise, apple cider, cider vinegar, and sugar until smooth. Pour the cider and mayonnaise dressing over the cabbage mixture and stir well to combine. Cover and refrigerate at least 60 minutes for the flavors to marry. Serve chilled with additional dried cranberries and sunflower seeds to the top, if desired. I sincerely hope you’ve enjoyed today’s recipe for Copycat Sunflower Crunch Kale Cabbage Salad as much as I’ve enjoyed bringing it to you! Such great instructions and tips, who needs the bag? Thanks so much for this! Thanks so much, Beth! I’m glad you like the recipe! SO fabulous! I could eat this every single day…the perfect salad! When I have it in my fridge, I definitely eat it every day. I seriously can’t get enough! So healthy, so delicious! Love all that crunch. It’s a bonus after the delicious factor! I love all the delicious crunch! Totally addictive! Thank you, and you’re right. It’s TOTALLY addictive! I love how easy this is but it has so many awesome flavors and textures! Perfect for all my upcoming parties and events! 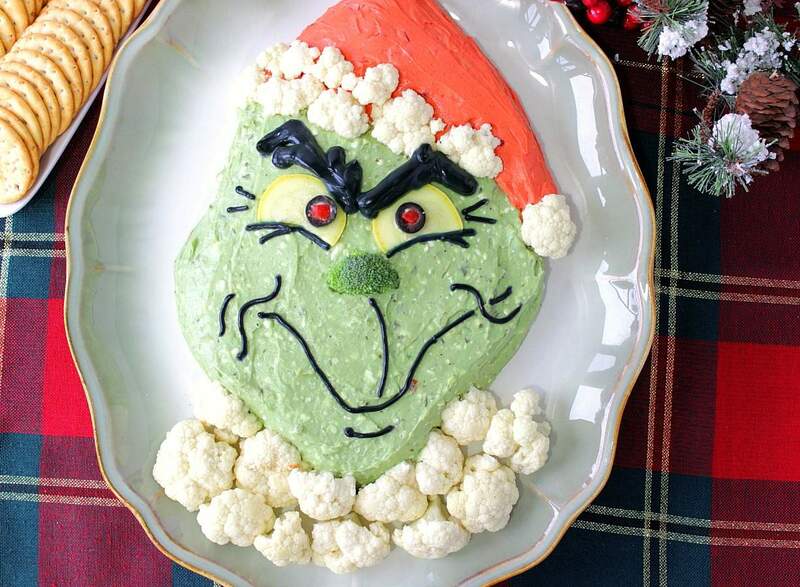 I’m glad you’re thinking of entertaining with this salad. It really does please an entire crowd. Thanks, Meagen! Hey Renee, this sounds amazing! What is the portion per serving? I’m on Weight Watchers so I’d like to calculate the points. A serving size is approximately 1/2 cup. I hope this helps. Thanks, Renee! Can’t wait to try it! Does it keep for 5 days with the dressing mixed in, or do I keep it dry until ready to eat? Great question, Jennifer. Keep it dry until ready to eat. The day you’re going to serve, add the dressing and chill for about 3-4 hours. What is the serving size for this recipe? The nutrition facts says 1g, which must be a typo. Sorry about that. I’ve gone ahead and adjusted the post, recipe card, and the serving size for being 1 cup of salad. What a delicious side dish! It’s sure to be a favorite! Thank you, Lindsay! It’s always been a hit whenever I’ve served it! I loved it! So flavorful! I’m not a fan of kale, would spinach hold up in this salad? Everything else sounds awesome. Great question, but I’m not 100% sure. My guess would be no because I think it would get too soggy. If you’re not a fan of kale, why not leave it out? Or, how about if you finely chop some broccoli (florets, and stems, if you’re so inclined), and add those to the salad? I think that would be a terrific addition and one that would hold up well to all the other ingredients. I’m anxious to know what you decide to do. Let me know. I’d love to hear. What kind of mayo do you use in this recipe? Looks delicious. I use Hellmann’s. If you decide to use something like a MiracleWhip, I suggest cutting back on the amount of sugar called for in the recipe. Besides that, any mayo you use should be fine.